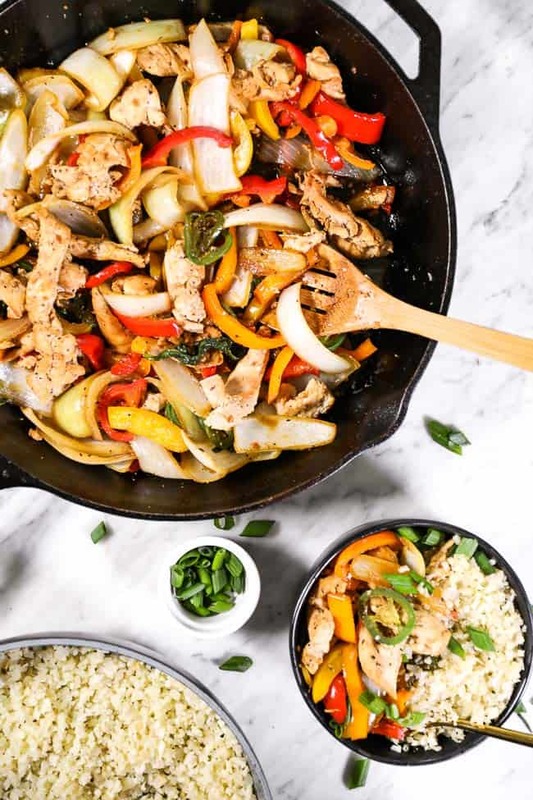 These Paleo, Whole30 + Keto Thai basil chicken bowls are a healthy stir-fry. It’s a colorful meal, full of fresh vegetables and flavors, and an easy weeknight dinner! We love Asian inspired dishes and eat them often. 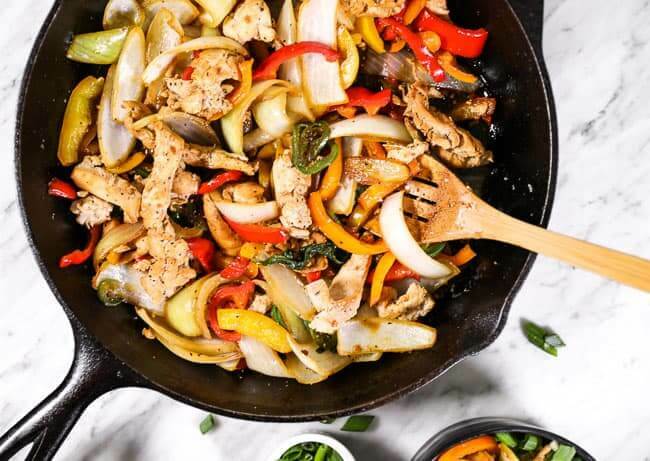 Healthy stir-fry dishes are among our favorite to prepare, especially when they have savory, sweet flavors like this Thai basil chicken. You get savory goodness from the sauce and seasonings, and paired with the bell peppers you get a bit of crunch and sweetness. 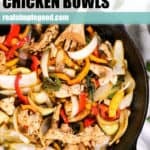 You will love the combo of flavors and how easily they liven up this chicken stir-fry. 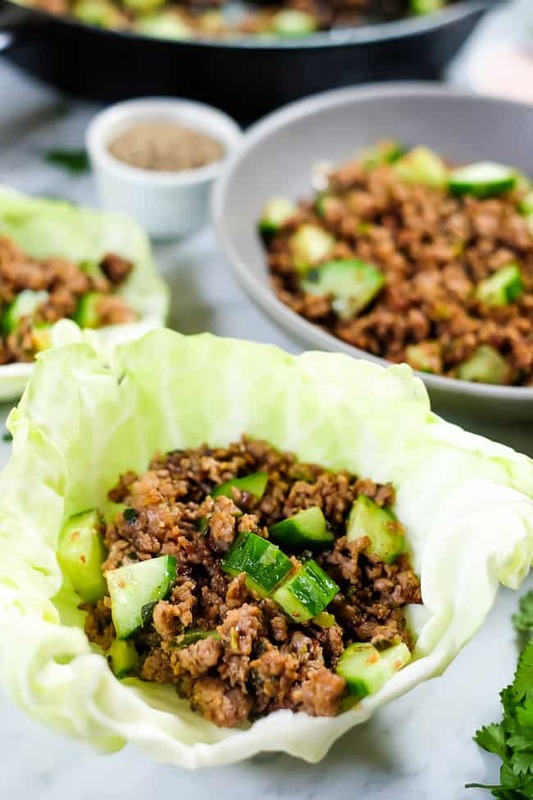 This recipe calls for Thai or Asian Basil, and we can sometimes find it locally at Whole Foods, but when it’s not available we just use regular Italian Basil and it still comes out delicious! So…if you have any trouble locating Thai Basil, it’s really not a big deal. Just go with Italian Basil and call it good! But…if you can easily get your hands on Thai Basil, do it! 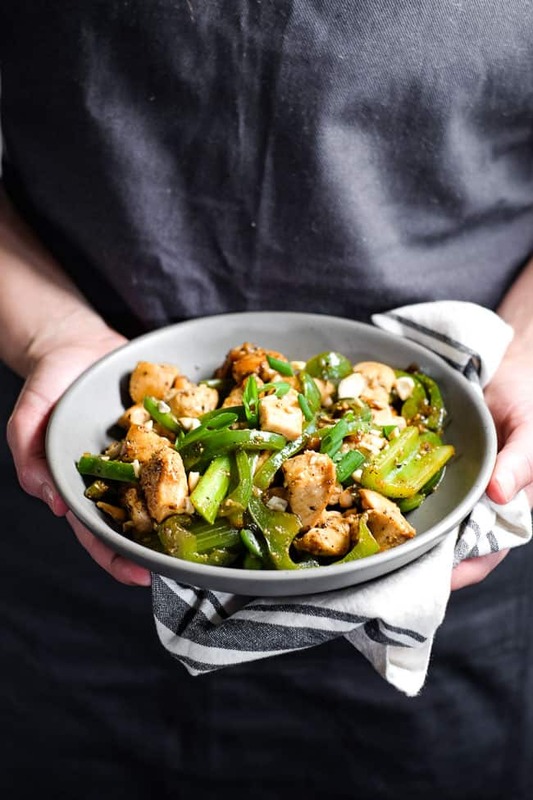 You will love the distinct flavor and how it pairs with the rest of the flavors in this Thai basil chicken. We love re-creating the flavors of takeout at home. 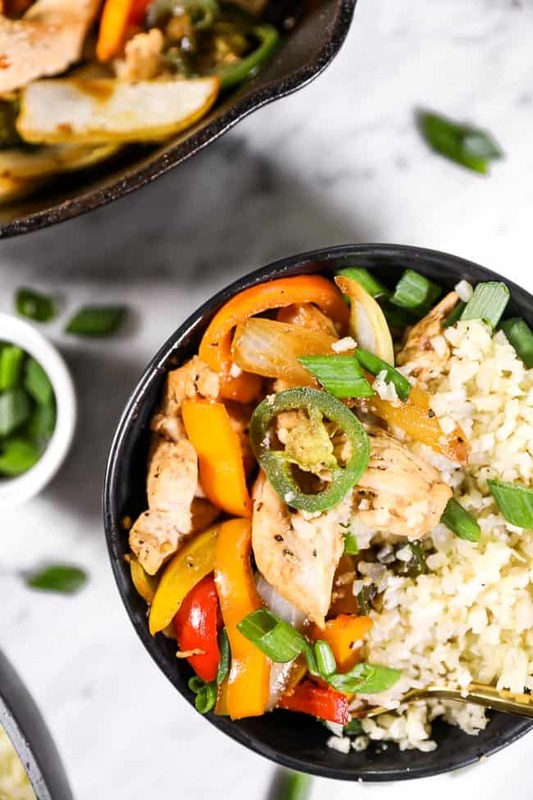 These Thai basil chicken bowls feel like you ordered takeout, but you’ll be able to pronounce all the ingredients and know you’re eating a much healthier meal! 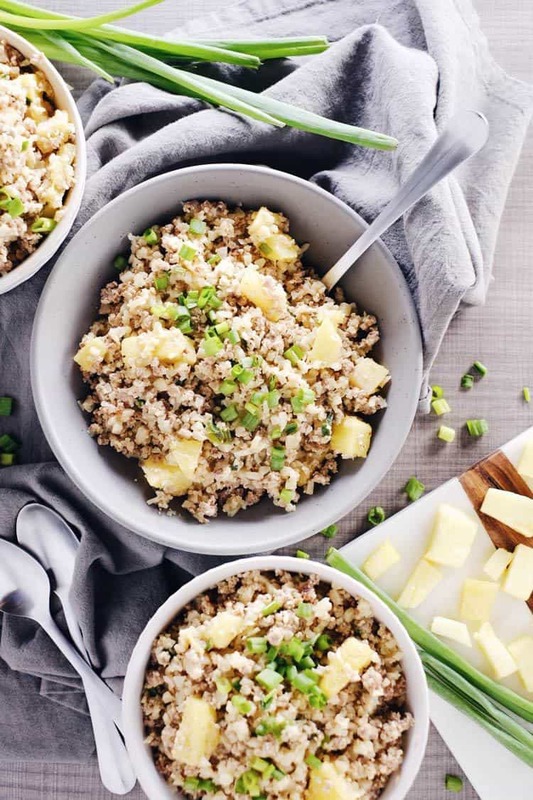 Plus, it’s an easy one to make, and you can tailor it to your preferences with either cauliflower rice (Whole30 + Keto) or plain white rice if you’re a little more relaxed with your eating. 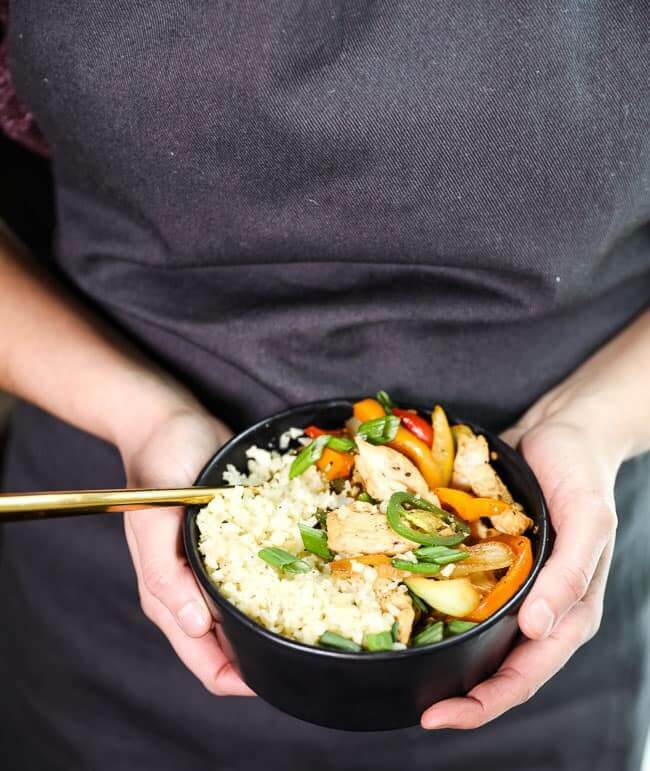 Whether you want takeout, something Asian inspired or just a great weeknight meal, plan to make these Thai basil chicken bowls! 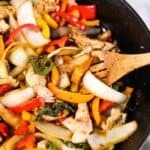 They’re an easy and healthy stir fry recipe. Leave a comment below and let us know how it goes. Also, take a pic to share on Instagram. Tag us @realsimplegood so we can check it out! Make sure to give us a follow if you don’t already, too. We’d love to stay connected! 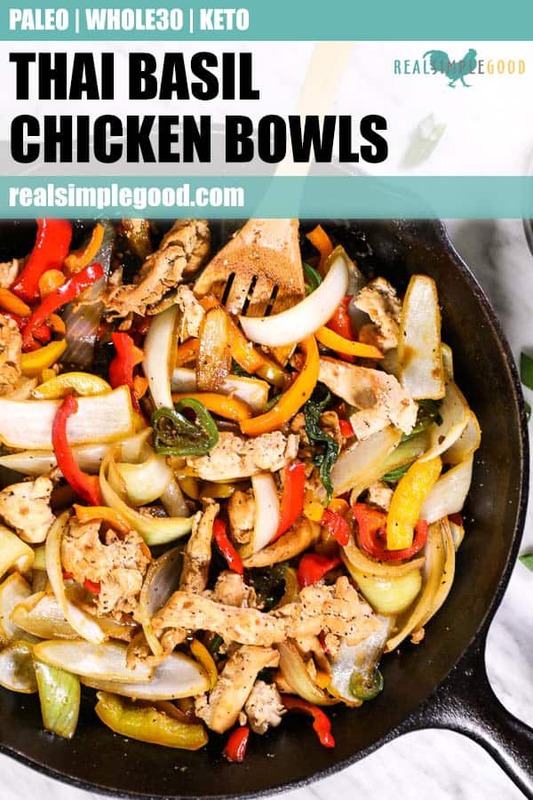 These Paleo, Whole30 + Keto Thai basil chicken bowls are a healthy stir-fry. 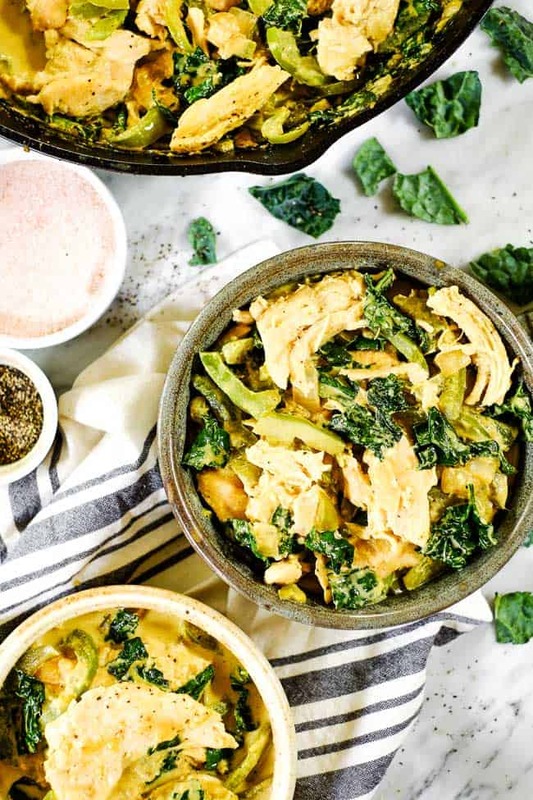 It’s a veggie filled, colorful meal and an easy weeknight dinner! 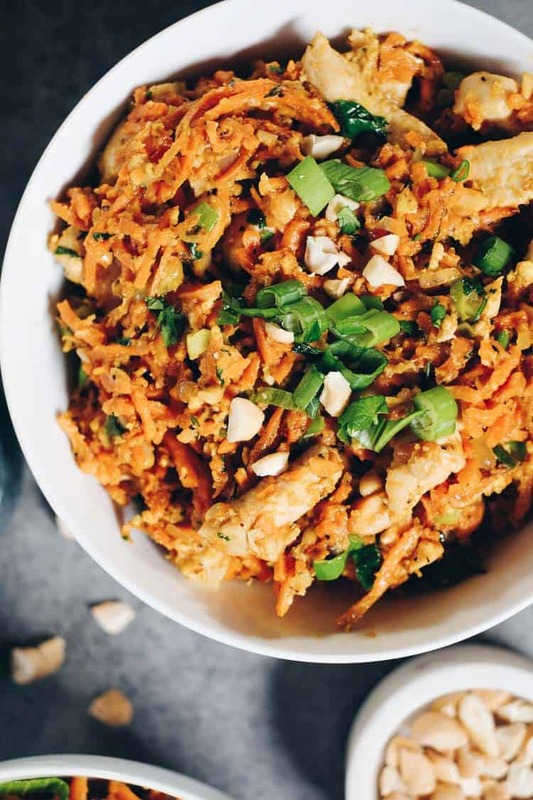 You’ll feel like you indulged in takeout, but this stir-fry is way healthier! 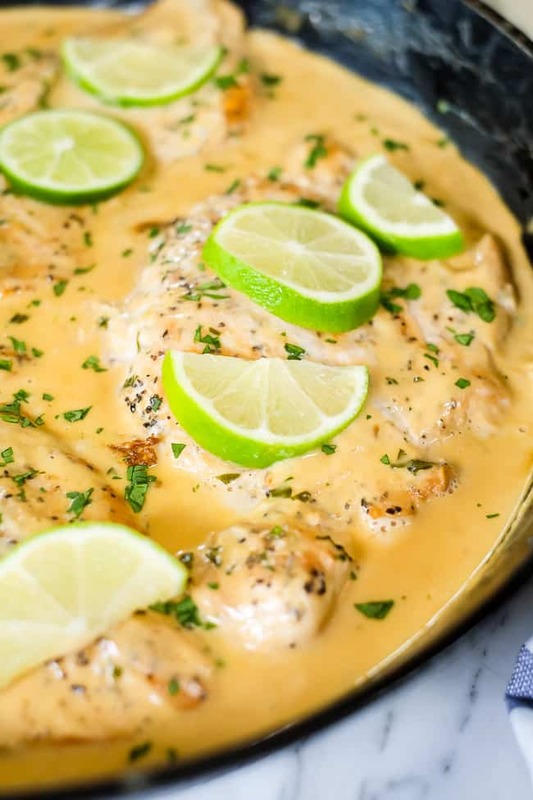 Place chicken breasts between two sheets of parchment paper or plastic wrap and use a meat mallet or rolling pin to flatten your chicken so that the pieces are even in thickness. Then, slice into thin strips. In a large skillet or wok over medium heat, add avocado oil and chicken to pan. Season with a generous pinch of sea salt and ground pepper. Cook, stirring occasionally until chicken is cooked through, about 10-12 minutes. While chicken is cooking, prep garlic, onion, bell peppers, green onion and jalapeño as noted and set aside. Also, prepare sauce by whisking all sauce ingredients in a small bowl or jar. Set aside. Once chicken is done, remove and set aside on a plate. In the same skillet over medium heat, add avocado oil, onion wedges and bell pepper, stirring occasionally until softened, about 3-4 minutes. Add garlic, jalapeño if you’re using it and basil. Cook for another 1-2 minutes. Add sauce and chicken back in. Stir to combine everything, and let cook for just a couple minutes to re-heat chicken. Serve with cauliflower or white rice and garnish with green onion.